First up, a drive to make quilts for those affected by hurricane Sandy in the New Jersey area. Jennifer from Knotted Thread has posted here about the devastation in her hometown and stories of friends and family whose lives have been dramatically changed. As a longtime resident of Florida I'm very familiar with hurricanes. I've been through quite a few. I've had damaged homes, loss of power, the inability to make phone calls to reassure people that you're okay. While destructive and heart-breaking, they all inspired an outpouring of community outreach and hope. So please consider helping Jennifer's campaign...we may not be physically right next to the people of the Northeast as they endure Sandy's aftermath, but we can show them that we are committed to support them in any way we can, even if it's just the smell and feel of a freshly made quilt that has caring in every stitch. You can read Jessica's entire post here, but for the next few weeks a bunch of bloggers are going to be talking about improving a technique or challenging themselves with something new. Then on November 30th there will be a link-up for everyone to share their own confrontation! Jessica put up her post today about cutting accurately. And boy is it a problem that I have all the time, mainly due to my impatience. I'm up next week talking about that pesky 1/4" seam allowance, so check back in to hear my thoughts and see some fails and successes in that realm. 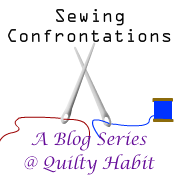 *AND link up at Quilty Habit!